"Peace of mind from beginning to the end"
"In 2008 we began construction of our Dream Home! Gilbert Construction brought to fruition what we could only imagine and completed our project under budget and on time. Greg made what could have been a very stressful time in our lives something that we now look back on with full gratitude and accomplishment. Greg's skill, integrity and professionalism gave us peace of mind from beginning to the end." "Professionalism, attention to detail and timeliness"
"We are very pleased that we hired Gilbert Construction to complete our 700 sq ft two-story addition. We were so impressed with their professionalism, attention to detail and timeliness. Greg’s many years of construction experience enabled him to make suggestions during the project that made the finished product seem like a natural extension of the house. I highly recommend their services!" "I would recommend Gilbert Construction to anyone. Since I wasn't sure what I wanted, he listened to my ideas and worked with me until I was satisfied with the final plans and the price. Greg was very easy to work with, quick to respond to questions or complaints and I am very pleased with my family room and master suite addition." "Before I hired Gilbert Construction I did a little research, so I knew this company had a good reputation. I suspected they would give me a good value and be easy to work with. My expectations were exceeded. I found Greg very cooperative, easy to reach and always ready to address any issues I would bring up. He was very courteous and easy to work with. The workers did a beautiful job, on time and I'm very happy with the result. I highly recommend this company." "Been doing business with Gilbert for 14 years. Always on time for price quotes and completing the job without cost over runs. Works with customer for the best way to approach any home improvement project." "In 2009 our house underwent an extreme makeover including the addition of a second story and 1200 sq ft. For this project, we interviewed 7 contractors representing the entire business spectrum. Throughout the interview process Gilbert Construction stood out as our front runner and got the contract. Their pledge describes their work, Gilbert Construction did an outstanding job from start to finish. Integrity, competence and value are what you get when you become one of Greg's clients. 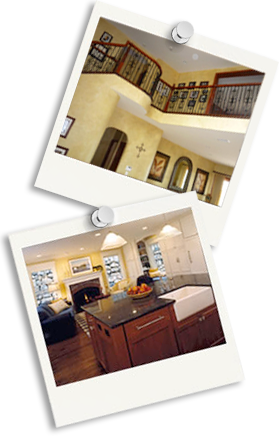 We strongly recommend that you choose Gilbert Construction to accomplish your renovation project." We offer expert design and building services for both large and small projects. Together we can turn your dreams into a reality. We look forward to hearing more about your project. Let our experience and knowledge be your guide to making that dream come true. Call or e-mail us today for your free consultation and estimate.